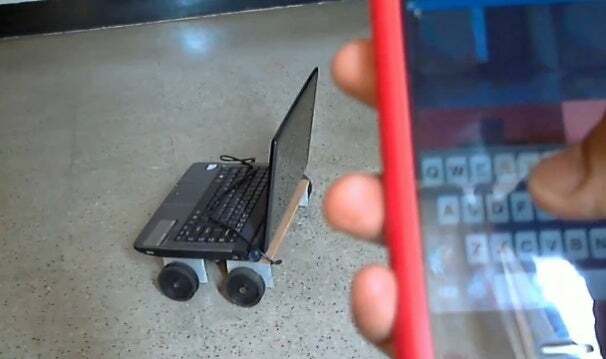 It’s not unusual for an iPhone to be used to operate remote control gadgets like the AR Drone quadrocopter or to work with your computer, but this hack by Avadhut Deshmukh combines those with a laptop on wheels. To control the robot, you press buttons on the iPhone’s keyboard to send commands to the laptop, which controls the direction that the robot it sits on will go in via an attached Arduino board. While sticking an Acer on top could be a bit bulky for a robot, there’s a few benefits in using one in a project like this: It's Internet-connected and you could use almost anything to control it anywhere in the world, as well as connect it up to any peripherals or software you can run on your PC. Avadhut says this means the possibilities are almost endless, and that in this hack his computer can “follow certain colors, follow human faces, detect flames, drive around the house avoiding walls,” and be driven by a Wii Remote. In addition to all the clever software used to help drive it, the robot feeds video from the laptop's webcam to the iPhone's screen, so you don't have to blindly navigate a room. A remote-controlled computer isn’t as baffling an idea as it seems: We've seen the potential such a bot has thanks to the DarwinBot, a Microsoft engineer’s laptop-powered robot that’ll let you play with your pets and play fetch over the Internet. This bot isn't Avadhut’s first phone-based robot hack, but it is a bit more advanced than his last, which was powered by two cellphones. While I don't expect to have my laptop follow me around on wheels like an obedient dog any time soon, it does raise an interesting question--computers are becoming smaller and ever easier for us to carry around... but why not let the computers carry themselves? And check out the Instructables project page for full instructions.